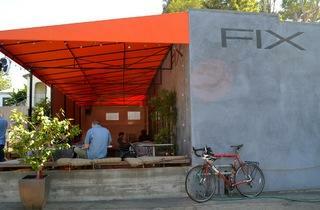 Fix sits tucked into the hillside, way up Echo Park Ave and catty-corner from an elementary school (no, frolicing children won't disrupt your workflow—it's almost eerily silent over there). There are no other shops or restaurants nearby—Fix is in a decidedly residential area—so there aren't many distractions, aside from the good lookin' baristas. The space itself is gorgeous as well, with a sunny outdoor area (complete with firepit for "chilly" winter days), a covered patio and an indoor space with bar seating and tables for two. Aside from the extensive coffee list, the bar offers fresh teas, mixed juices and pretty impressive eats: alongside the usual pastry fare, you'll find savory lentil salads, cheese sandwiches and vegan options aplenty. It's a great spot to get some work done, not in small part due to its location in a cell tower dead zone. Like we said, no distractions! 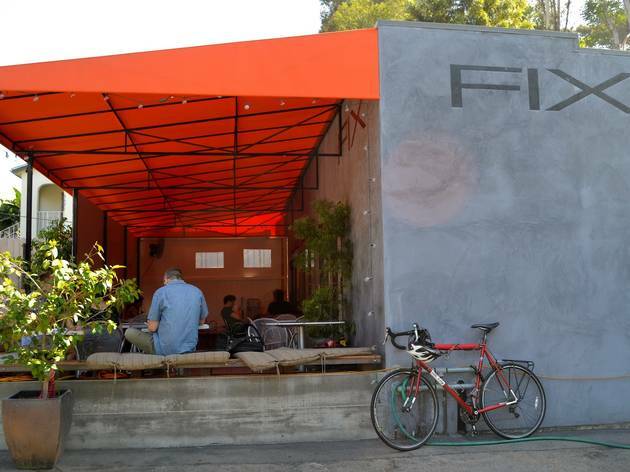 Fix is a great little neighborhood spot—the staff is always nice, although sometimes the regular clientele can be a bit territorial, especially to those who don't look as hip as they do. The best part about this place is that it's tucked back into the Echo Park hills, which means no cell service which means no distractions when you're trying to get work done.